Did you know that beef is banned in India? I knew that the Hindu religion worships cows, but I did not realize how strict and enforced the belief was. Cow slaughter and consumption is illegal in the majority of India, except in 4 states. The Rajasthan state I travelled with in has a ten year jail punishment if you break the law. There was no beef on the menu at all. Not even at hotels for tourist! Pork is also not that readily available. The common meat found on the menu is chicken, fish, and lamb. I like fish and seafood, which I mainly stuck to. Lamb I stay away from, and chicken is my least favorite meat. So imagine how excited I felt when I saw B. A. E. for breakfast - bacon and eggs - on the menu! HEAVEN. You know that feeling when you can't have something and you end up craving it more then normal? All I could think about was having a steak when returning home! Of course I did!! This juicy Porterhouse steak for two hit the spot. Get it at Keens Steakhouse. 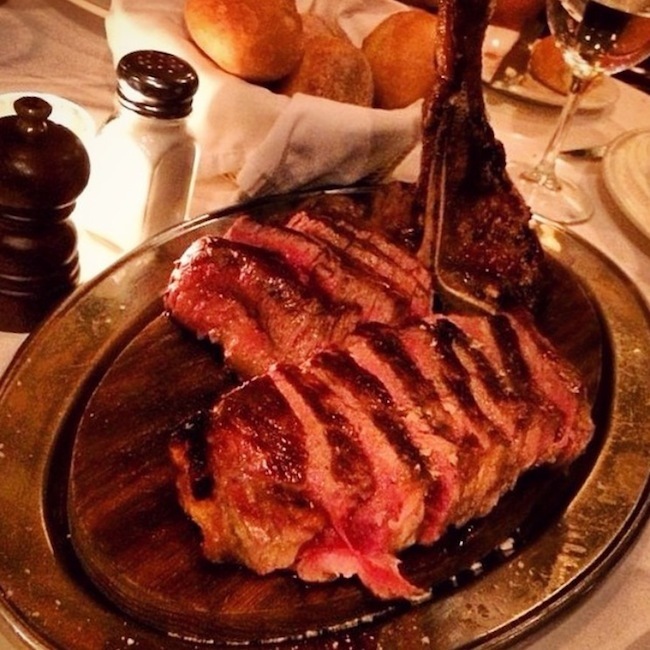 One of NYC's top steakhouses, and conveniently located in midtown near Madison Square Garden. Good pre game slash concert date night for you carnivore lovers. Reservations for the 'Dining Room' are highly recommended since it's a popular joint, especially on game nights. If your the non planner type, walk in seatings are available in the 'Up Room', where you can test your luck. But then don't have a cow if there's a ridiculous wait time. Pun intended! HA.